Garrett Kelleher failed to pay nearly $430,000 in property taxes due nearly two months ago on the proposed site of the Spire, even as the Irish developer was launching a lavish, five-city Asian tour to trumpet the massive skyscraper…. A spokeswoman for the 150-story Spire … confirmed that the taxes were past due and blamed an error in the address for the tax bills…. The March 4 payment date is at least the third time Shelbourne has been behind in its property taxes. The Dec. 3 payment was made 11 days late. The March 1, 2007, taxes weren’t paid until May 21 of that year…. 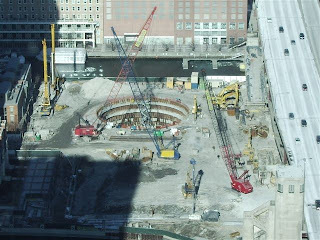 A photo taken not long ago of the construction site in Chicago by Lake Michigan and the river for Santiago Calatrava’s spire. Work is progressing. And it looks like specific work for this specific project, not just caissons that could be used for anything built on the site. How will the downturn in the housing market and in the world’s economy affect this project – which was always “iffy?” Do such mundane matters affect those who might consider buying here? I’ll still be surprised – pleasantly – if it goes up, looking like this. Also in the photo at the top you can see work being done on DuSable Park. Another cause for celebration. A skyscraper to make your head spin. Update! 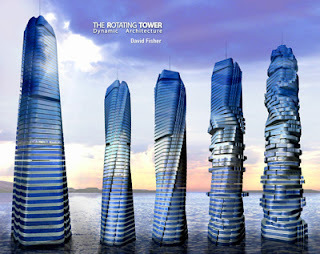 May 6, 2007 David Fisher is trying to convince the powers-that-be in New York City, Miami and Chicago that this is a viable concept. At least two developers in Chicago are interested? The Dynamic Architecture buildings keep changing their shape. As each floor rotates separately, the form of the building is changing constantly; you may not see the same building twice. Dynamic architecture marks a new era in architecture as this new approach, based on motion dynamics, is in fact challenging traditional architecture that until now has been based on gravity. Dynamic Architecture buildings will become the symbol of a new philosophy that will change the look of our cities and the concept of living. From now on, buildings will have a fourth new dimension – TIME. Buildings will not be confined to rigid shapes; construction will have a new approach and flexibility. Cities will change faster than we ever imagined. I thought buildings always involved the dimension of time. But click on this link, it is worth seeing, cheesy animations and all. And you thought the proposed twisting tower by Calatrava was futuristic. The City of Chicago Plan Commission recommends unanimously that the zoning committee approve the latest designs for the Chicago Spire. Romantic, eh? Wonder what it would really be like? I admire how it touches the ground lightly. Everyone I talk to likes the profile of the original scheme the best, (except for the original base of several levels of parking,) but says this new one is also fantastic. Kelleher the Developer knows best. But, since you asked, I don’t see how this can get this built. Not with a price tag of more than 2 billion dollars. Kelleher would have to charge more per unit than I think this market can bear. Who would be the clientele for such a place in Chicago? Well, Dublin-based, former Chicagoan Garrett Kelleher, head of Shelbourne Development, worth a reported $750 million, certainly knows real-estate better than I. In any case, it sure is pretty, it sheds good light on Chicago that we’re even considering this, and and Mayor Daley desperately wants it. 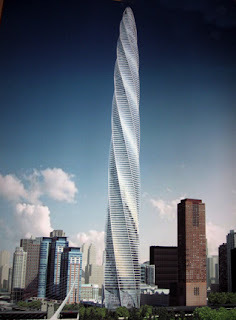 That and about 2 billion dollars will get you a tower like this built here. Now, where to find those 2 billion? that 2 billion dollars can’t fix. Please call if you’d like to finance this tower. 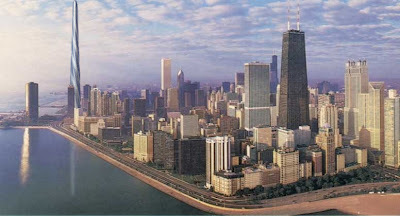 The approved plan features several improvements to earlier designs that will enhance The Chicago Spire’s integration with the surrounding environment, including a spectacular four-story transparent glass lobby, an underground parking garage for residents and a one-acre landscaped public plaza. In addition, The Chicago Spire will be engineered to meet the gold standard of LEED certification, which dictates among other things that rainwater be recycled for landscaping treatments, river water be used for cooling and special glass be included to protect migratory birds. People laughed. Then he said, and many will be art collectors, maybe with Matisse on the wall! And nearby, on a table was this image of the slender, transparent base. Remember? The delicate lady in high heels. 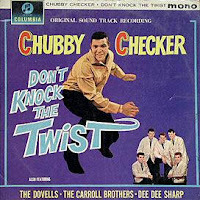 Does kind of look like “the Twist,” doesn’t it? C’mon baby! Let’s do the Twist! -but can you twist in high heels? At the evening meeting we saw the master create beauty. With an overhead projector he drew watercolors. This one shows how his building would meet the ground. And then compared that to…. 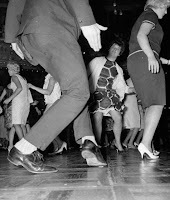 C’mon Chicago, let’s do the Twist! Developer Garrett Kelleher talks a lot about the international nature of this project and how (wealthy) people from around the world will want to live here. 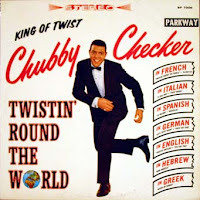 He’s the King of Twist. At the meeting tonight of area residents, many were concerned about increased traffic and congestion. On and off ramps would be built to lower Lake Shore Drive, all trucks would use those and between 50 and 90% of the traffic to the building, according to a traffic engineer who spoke. 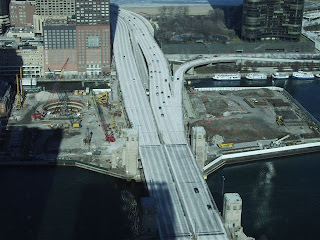 Those ramps would provide direct access to the Chicago Spire drop-off points and to the parking. I believe that this great project this needs to be approved by the city. 1200 new units will increase traffic some but the great benefits far outweigh the negatives. If we want to limit traffic there are ways to do it, for example let’s de-prioritize the automobile in the city, and to reduce cars, let’s block the many mediocre buildings going up in Chicago, not this one. More about tonight’s meeting soon. Maybe I’d be more serious if we knew this project was really happening and not just a castle in the air. Oh, and Santiago Calatrava after drawing and dreaming for the crowd? Rock Star. 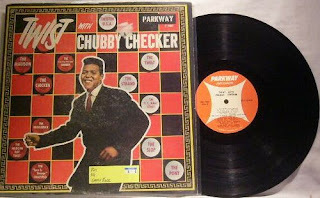 Bigger than Chubby! 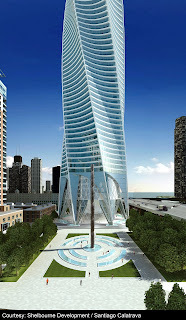 Calatrava / Chicago Spire developer won’t talk $. After today’s public meeting with precious little hard information, developer Garrett Kelleher walked off in a huff when asked how much the Chicago Spire will cost to build and how much he will have to charge people to live in it. We got no answers from him on that. Today’s meeting revealed not much more than the one two weeks ago. Again Calatrava talked mainly about the public plaza at the base of the building, also about how slender the tower will be, how this is made possible by advancements in engineering and thus his building fits in the great Chicago tradition of furthering skyscraper technology. He calls it an “heroic” building, like the great John Hancock here. And he’s right. And we haven’t had many of those here since the Hancock and the Sears Towers. We did see a model, that was new. And Blair gets a copy of the animated “fly-around” we saw. Check it out, and his story here. Calatrava asked that we understand it was made in just four days. Ths shape and the twist have been refined, but they will be refined again. Where once there was to have been a bright beacon shining straight up into the sky from the top, now we’ll get, “just a light every so often,” Mr. Kelleher told me. And he still says “Anglo-Irish Bank is fully committed to this project,” but won’t provide details. Mainly we got to hear that inspiring, cultured, humanist and romantic talk from the architect. With little new information, enjoy the new pictures. I love how Santiago Calatrava just happens to leave his props around, the props he uses to explain the inspiration for his building. Don’t the photographers love it! We have another meeting with Calatrava and Kelleher tonight. Stay tuned. Update: Words and pix coming soon. Calatrava even drew for us. Ladies shoes – high heels. He compared how his building meets the ground to ladies shoes! I’ll post those soon. with a tip of the hat to the great James Thurber . Santiago Calatrava and the developer Garrett Kelleher spoke to a turn-’em-away crowd tonight at the Chicago Architecture Foundation. The tower may be tall, but they were short on specifics. The closest they came to making news was, when asked, “how much will the condos cost?” Kelleher said that high end projects in Chicago get about $1200 a square foot, in New York they sell for $3,500 to $4,000 a square foot and a project in London is asking $9,000 a square foot in a Richard Rogers building. He said the Chicago Spire will be “somewhere in between.” And everyone laughed. And maybe it was a joke. Because in the past we were led to believe by Kelleher’s Shelbourne Development that these would sell for maybe at the high end, in the $3,000/sq. ft. range. Kelleher seemed to up the ante tonight. But he keeps talking about an international crowd who would want to buy a unit here. How he’s going to market it all over the world. That enough people with enough means want to have a pied a terre here. (‘foot on the ground?’ At 2000 feet high this is more like a ‘pied a l’air’ isn’t it?) Maybe Mr. Kelleher will be right. He also said that in his 15 or 16 years as a developer this is the best site that’s ever been available to him. He called it a “once-in-a-lifetime chance” – to work with Calatrava and because, you get that sense that Chicago made this man. He worked here for ten years for North side developers, his first two children were born here, then Kelleher went back to Ireland and became a very wealthy man in the incredible boom there. He seems to want to give something back. He’s just iching to order his caissons. He also said he wants it to have at least the minimum LEED (“green”) certification. And the tower, as you can see in the top photo, is still seven-sided. It’s wonderful to listen to Santiago Calatrava speak, about how the footprint of the building should be minimal, how it should be transparent, how important it is to maximize the open space around the building, and offer the public places to sit, with artwork around (his own sculptures as at the base of his twisting tower in Malmo, Sweden?) and Calatrava even said the base must have interesting lighting. Here’s a sketch he showed of undetailed concepts for how at the base, the structure could “lightly” meet the ground. And he showed large watercolors of the green spaces he is sketching for the east side of Lake Shore Drive. The man who doesn’t drive a car – Santiago Calatrava – said Lake Shore Drive itself needs to be “uplifted, urbanized, civilized, embellished.” Boy is he right. He’d plant “masses of trees” alongside it, near his tower. Keep imagining, Sir. We must. He then showed how the traffic engineers in Zurich place trees or other obstructions on the sides of streets so cars have to zig-zag and they can’t drive fast. I gasped when I thought of what the people here would think of that idea, which is a good one, and is common in Europe. But the folks at home will no doubt appreciate Calatrava saying that DuSable Park, named for the designated founder of this city and to be located across Lake Shore Drive from his tower, will have a symbiotic relationship with his skyscraper. Of which he really only talked about the lower 65 feet or so. What was not referred to was the gigantic height of this thing, some 2000 feet! (Sears Tower by comparison is ‘only’ 1,450 feet.) The only mention of the height Calatrava made was to try to knock it down to size, by saying he is designing at two scales – yes a very tall building, but one that he wants to be light and detailed and human scale at the base. That’s great, and he’s right to do that. But it will still be 2,000 feet in the sky if it gets built. I wish they had spoken of that great height and that great scale, and what it would mean for the people down below, as well as for the skyline. It’s big no matter how you try to get around it, and big buildings have a big impact on their communities. Calatrava does pay attention to detail. Before giving his talk he walked through the exhibition at the Architecture Foundation, in the atrium of the Santa Fe building. There, with what seems to be fairly constant with him – delight at the beauty of the world – he examined the details of the desks and chairs and other objects on view that Frank Lloyd Wright designed to go into his Price Tower in Oklahoma. 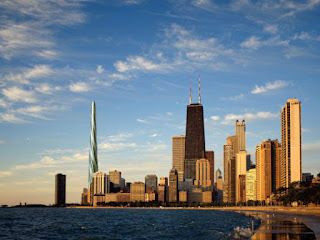 The latest renderings of the Chicago Spire, which Kelleher referred to as “the final drawings, I hope they’re the final drawings” will be released at a “Chicago Spire Community Meeting” – open to the public, sponsored by SOAR, the Streeterville Organization of Active Residents on March 26th. Mssrs. Kelleher and Calatrava will be there. I’m trying to get them on my radio show. Final design plans are scheduled to be discussed by the Chicago Plan Commission on April 19th, before presentation to the City Council Zoning Committee and the full City Council. And then, if the City Council likes it, Mr, Kelleher can start with his caissons. Oh, except there’s still that pesky little issue of financing. Which was also not clearly answered, when asked, at tonight’s meeting. Mr. Kelleher’s answer was, “The financing will be debt, and equity.” Another laugh. A nervous laugh? Kelleher said he met with the Anglo-Irish bank this morning and they are “fully committed.” But he did not give numbers. He said that he is currently bearing all the costs. There are no other investors. And though he currently has projects in Brussels, the Baltics, France, London and Ireland, this one thrills him. We wish Garrett Kelleher all the best with this. I believe this tower would be good for Chicago. And that Calatrava does raise the bar. 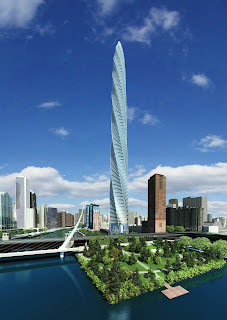 Blair has everything on the latest Calatrava Chicago Spire. Including a Chicago Tribune video with images of the building. You are currently browsing the archives for the Calatrava category.